Ginger, the Milwaukee County Zoo’s newest impala was born sometime in the early morning hours of a bitter cold Wisconsin day, January 21, 2013, to 4-year-old mom, Doruba. Ginger was born at the Zoo’s Winter Quarters – an off-exhibit area where warm-weather animals are housed during Wisconsin’s colder months. Unfortunately, Doruba was not showing interest in Ginger – not an uncommon occurrence in first-time impala moms. Zookeepers’ attempts to encourage Ginger and Doruba to bond were unsuccessful, and as a result, Ginger’s body temperature was dropping. Once Ginger became too cold, she was not even able to nurse from a bottle administered by zookeepers. The solution? The five-pound, 1-day-old baby was moved to the Zoo’s Animal Health Center, where she was warmed up, bottle-fed and then hand-raised by Health Center staff. Initially, she was bottle-fed a formula consisting of lamb milk replacer, cow colostrum, essential fatty acids and probiotics three times during the day and once at night. By March 20 she had grown to over 24 pounds and she was reintroduced to the herd on March 23. Although Ginger’s mom, Doruba, no longer recognizes Ginger, 3-year-old Cassia, another Zoo hand-raised impala, has taken on the caretaker role and is often seen grooming young Ginger! Ginger is still bottle-fed by keepers, but the frequency has decreased to twice per day. Ginger will continue bottle-feeding until she starts eating the same food as the other impalas consisting of hay and dry pellets. So far, she only nibbles on hay and has not shown interest in dry pellets, yet. 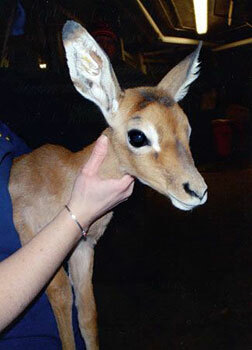 The Zoo also welcomes another impala, Mara, born January 1 to mom Nutmeg. Mara and Ginger are half sisters and share the same father, Riccolini. Once our Wisconsin weather gets warmer, Ginger, Cassia, Doruba, Mara and the entire impala herd will be on outdoor display in the African Savanna Exhibit.